Ground heat recovery systems use a piping system filled with a brine solution for underground heat recovery. The system is buried underground, where temperatures are almost constant throughout the year. A heat pump delivers the cold fluid to the inlet of the underground piping. Then, the fluid flows in the pipe and is heated by the ambient underground, which has a higher temperature than the brine inside the piping, supplying the heat pump with the recovered heat. A ground heat recovery system supplying a heat pump. Simulation software packages, such as COMSOL Multiphysics, offer a flexible environment to design effective systems by analyzing the influence of multiple physical variables. 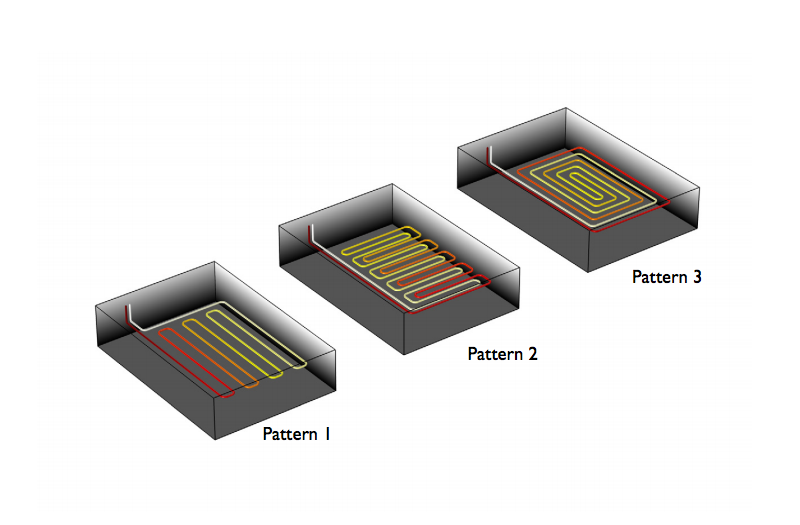 In our Ground Heat Recovery for Radiant Floor Heating tutorial model, we look at three pipe arrangement patterns (shown below). Using COMSOL Multiphysics, we analyze the different pipe arrangements within the same model using a parametric sweep. The performance of each given pattern can be investigated to identify which one will work best in a given environment. In the example, we apply a time-dependent temperature that corresponds to the typical temperature variation in central Europe. By downloading the model documentation, you can build this model and run it yourself. Three different pipe arrangements for an underground floor heating system. Until recently, this kind of study could only be performed by you, the simulation engineer. Having to make all of the changes to a design and answer your colleagues’ ‘what if’ questions would usually lead to a backlog of requests and a slow turnaround time for your colleagues and customers. Now, these colleagues can run their own simulation tests and report findings to customers themselves. With an easy-to-use, custom-built app, anyone can deliver accurate simulation results without the help of an expert. 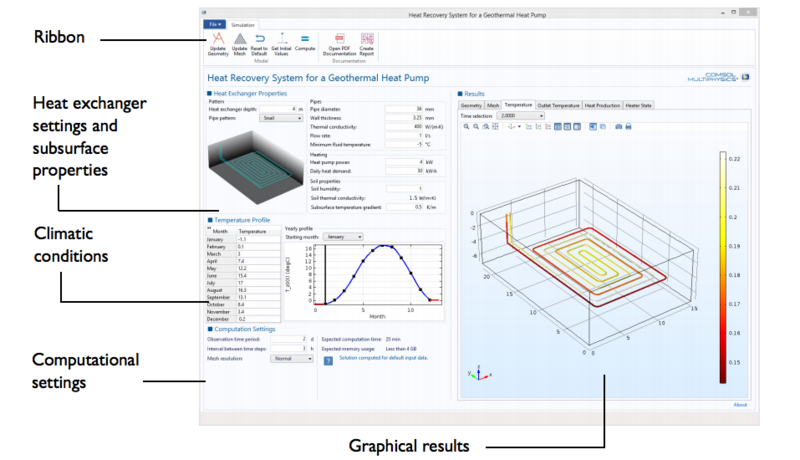 Our newly released Geothermal Heat Pump’s Heat Recovery System demo app shows how you can put the power of simulation into the hands of your colleagues and how, in turn, they can answer customers’ design requests. Using this demo app, anyone can change the properties of a heat exchanger to see how it affects the performance of the system. For example, we can modify the depth at which the pipe system is buried; pipe patterns; pipe properties, such as diameter and wall thickness; and fluid properties, such as flow rate and minimum fluid temperature. The user interface for the Geothermal Heat Pump’s Heat Recovery System app. The simulation engineer who creates the app has total freedom over its design, layout, and restrictions. This way, the app can be customized to accurately represent the environment. For example, a maximum depth for the exchanger can be applied. Such flexibility allows you to design an app that best suits the needs of the specific project and the app users. Let’s take a look at our example app, shown above. From the Heat Exchanger Properties section, app users can choose from three different pipe patterns and change the depth at which the heat exchanger is buried. They can then go on to make changes to the pipe, heating, and soil properties. The temperature profile can be customized by the user to account for climatic conditions and to choose the month during which to start the study. Finally, app users can make changes to how the study is computed using the fields in the Computational Settings section. They can define the observation time period and the interval between time steps, as well as select a mesh resolution. For instance, a coarse mesh would produce a faster solution but at a lower accuracy. Having made as many or as few changes as they would like, users are then able to update and compute the simulation via the buttons on the ribbon. The Results section updates and the geometry, mesh, temperature, output temperature, heat production, and heater state can be explored. Such results can be easily visualized and understood by those without simulation expertise. Using an app, the complexities that were once a barrier to the mainstream use of simulation software are now hidden behind a simple, user-friendly interface. The Application Builder and COMSOL Server™ are bringing simulation to a larger group of users than ever before. Use this demo app as a starting point to build your own app, one that is tailored to the needs of your customers and colleagues. Find out more about the Application Builder and COMSOL Server™ via the resources below. Dear Abbie, First of All think you for this wonderful article. I simulated tutorial as it is but i am getting Error ” The following feature has encountered a problem: – Feature: Compile Equations: Time Dependent (sol3/st1) Unknown reinitialization variable comp1.t_stop.” and I an unable to debug it. please help me to let it done. For your question, please contact our Support team. 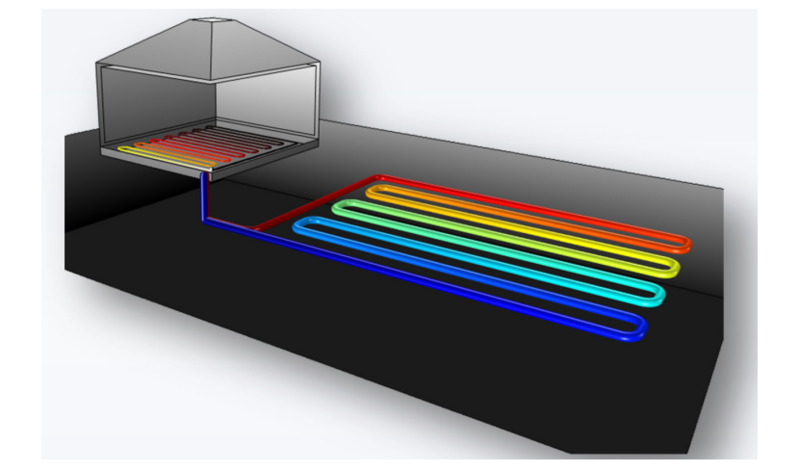 I would like to reconfigure the three patterns and simulate the heat exchanges from your March 14th, 2016 App: Design a Geothermal Heat Pump’s Heat Recovery System. 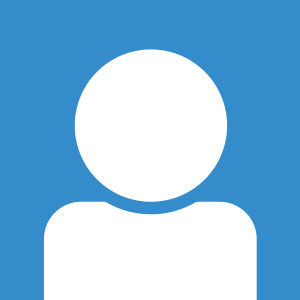 I am using COMSOL 5.3a. Could you help/advise me?